NOTE: Ymir-5 created by Erik Larsen, with help from Gary S. Carlson and Mark Englert. 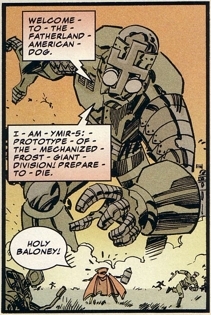 Ymir-5 was the prototype for the Mechanized Frost Giant Division that was being assembled by the Nazis back in World War II. It was unleashed upon American soldiers but Mighty Man flew in and destroyed the robot. He then demolished the bunker responsible for Ymir-5’s creation so that it could not be rebuilt and duplicated.